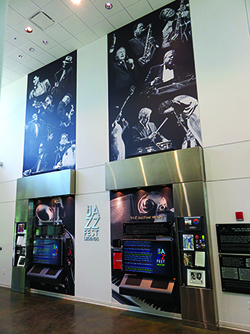 Cuyahoga Community College in June 2016 unveiled its new Tri-C JazzFest Legends Wall in the lobby of the Gill and Tommy LiPuma Center for Creative Arts. The installation celebrates the history of JazzFest and honors recipients of the Cleveland Music Legends Award for their contributions to American music. The wall features two, large, interactive screens. Visitors and students can explore the rich history of JazzFest through photographs, videos, programs, posters and artist biographies. Cleveland photographers Jeff Forman, Janet Macoska and Sheri Oliver culled hundreds of images from Tri-C’s archive and other collections to create a slideshow. Photos of JazzFest headliners such as Ella Fitzgerald, Sarah Vaughan, Miles Davis and Oscar Peterson are accompanied by quotes drawn from DownBeat magazine interviews and provided by publisher and Northeast Ohio native Frank Alkyer. The wall, which is 25 feet high, is broken into two main sections. The history section features several short videos narrated by key players in the evolution of JazzFest, including founder Thom Horning. The “Early Years” video explores the launch of JazzFest in 1980 and its early branding as “America’s premiere jazz education festival.” Additional videos showcasing artist residencies, Tri-C’s Jazz Studies program and community outreach, along with a complete archive of past programs and posters, round out the history section of the wall. The Cleveland Music Legends section features a slide show of award winners and video interviews with living legends — Jamey Haddad, Eddie Baccus, Kenny Davis, Sammy DeLeon, Evelyn Wright, Howie Smith and Vanessa Rubin. Highlights include anecdotes about Smith’s first saxophone lesson, DeLeon playing timbales with Tito Puente, and Haddad’s musical awakening.